In the late-nineteenth century, copies of the ‘Tara’ brooch were a must-have item of Celtic chic. One important nationalist organisation, Inghinidhe na hÉireann (Daughters of Ireland), headed by Maud Gonne, adopted it as its membership badge. The brooch, made over a thousand years earlier, became a symbol of the Irish cultural revival because it presented a stunning answer to Victorian theories of Irish racial backwardness. In this case, at least, the symbol is not let down by the reality: this brooch is an object that speaks of a culture functioning at the highest level of sophistication. It is not, in fact, associated with Tara: it was found in 1850 by a child playing on the seashore at Bettystown, Co. Meath, and sold by a ‘poor woman’ to a watchmaker in Drogheda. The watchmaker subsequently sold it to George Waterhouse, a shrewd Dublin businessman already involved in producing Celtic Revival jewellery, who renamed it the ‘Tara’ Brooch and displayed it at the Great Exhibition in London in 1851. Now, it seems not so much a museum piece as a whole museum in itself, a bravura display of multiple mastery. Although it is less than 9cm in diameter, approximately 76 patterns have been identified on its surface. Both faces of the brooch, and even the inner and outer edges of the ring, are covered with a teeming profusion of designs, each executed with dazzling skill. Even the cord that secured the brooch in position culminates in an elaborately designed link that incorporates serpent, animal and human heads. It is not the expression of a particular technique; it is a virtuoso performance of virtually every technique known to late-seventh and early-eighthcentury metalworkers. Gossamer-thin, interlocking spirals of copper-alloy are set against gold and silver. The technique of so-called chip-carving, borrowed from Germanic jewellery, is applied to create elongated birds, beasts and spiral patterns. Beaded and twisted gold wires are melded to bases of sheet gold. Variegated studs of glass and amber punctuate the patterns. On the front, a tiny filigree animal sits in a panel just 2cm wide, its front paw raised and its body winding back on itself. The back bears other animal patterns. This brooch was made for a member of an elite that saw itself as the equal of any other in post-Roman Europe. The brooch was used to fasten a cloak, which was worn over a tunic; a form of power-dressing that ultimately derives from the Mediterranean and the fashions of high-ranking officials in Byzantium. In Ireland, brooches were used in this way by high-status women, as well as by men, clerics and secular rulers alike. In slightly later high crosses, even Jesus and the Virgin Mary are wearing ‘Tara’-type brooches. The brooch also resonates with pre-Christian Irish beliefs. In one tale from around the time the ‘Tara’ brooch was made, a Munster king who sleeps with the goddess of sovereignty tells his wife to clothe the goddess in a purple cloak and ‘the queen’s brooch’. 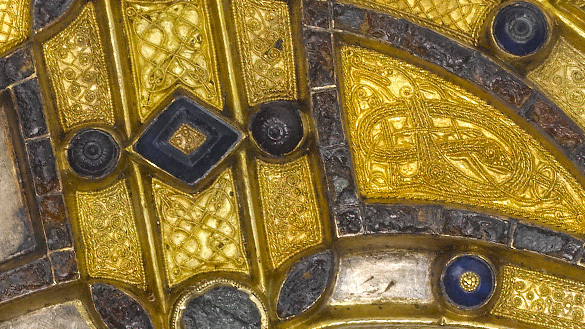 What we see in the ‘Tara’ brooch is a native Irish elite at the height of its self-confidence, easily integrating Christian with pre-Christian traditions, and its local power with a sense of being European. It is arguably the last time that such ease would be possible.